It is the little things that can mean a lot. When you go visit someone in the UK for the first you go equipped with their address, telephone number in case you get lost, some directions on how to get there by car, bus or whatever, and you may even resort to being helped en route by a satnav. Every house has either a number, a name, or both. Each street has a name. Most streets have street name signs – even the lane I live on has two name signs – one at each end of the lane. Each village/town has a name sign. So finding a house, even without a map should be possible. Here once you have got a village to find out where a particular family lives you must ask – no street names (sometimes there is only one street), no house numbers, no house names. What distinguishes one family’s home from another? As a small part of its community work with local village organisations Shakti staff have been motivating for house name plaques. Made from plastic to be resistant to the effects if climate, animals and insects, these will be fixed to the house wall. Nice to have yes, but they serve a purpose too. Far too often when a survey is being done, be it by the government or other agency, people are missed off the register. This happens because the official comes from town in office hours to a village deserted of its men and women folk who are off working in the fields or forest. The only folks left in the village the very young and the very old. So the official asks the old person who lives where, and what ever other questions he needs to have answered. Layer on top of an elderly person’s unreliable memory, the linguistics difference, the fact that everyone has multiple names – good name, nickname, short form name etc and confusion abounds. That’s why a NGO’s household surveys are more reliable as they work with the villagers to record them. The result can be that people in the village miss out of government schemes and entitlements. A name plate will at least mean the correct name is registered in the survey. But an even more important aspect of these name plates will be the sense of pride and raised self esteem it gives a villager. Often illiterate or semi literate, they have only seen house names on “important” people’s houses eg the doctor, now they too have one. 160 Rupees per plate (including a small contribution of 10 Rupees per household), 10 Rupees to fix, 170 Rupees well spent. Everywhere there is a drive for transparency – personally I hate how this word is used – if something is transparent you can see through it, if something is visible it is there to be seen – so in my book it should be visibility of due process, visibility of delivery that we are requiring. As it is its transparency of process, transparency of delivery. How do you prove to a donor that an education program to empower villagers to write their own name has delivered? In and of itself writing your name may be a good thing, joined up with being able to sign your attendance at a meeting, sign for you receipt of payment for work done, for receipt of your rice quota, sign on your saving bank record and the empowering domino effect can be seen to be underway. Shakti staff have been working with village women’s self help groups on a number of themes including programmes for water, sanitation and hygiene, livelihood security, mother and child health, land rights, participation in local government bodies (PRIs). One of the small components of which is a programme aimed at empowering woman to sign their names. So how do you prove to the donor that someone can now sign their name? Answer - Postcards! Every woman signs their card and the cards are delivered to the donor. The other side of the small component is the praise for the women who can sign – a small prize upon being able to sign your name is given, in this case bangles. 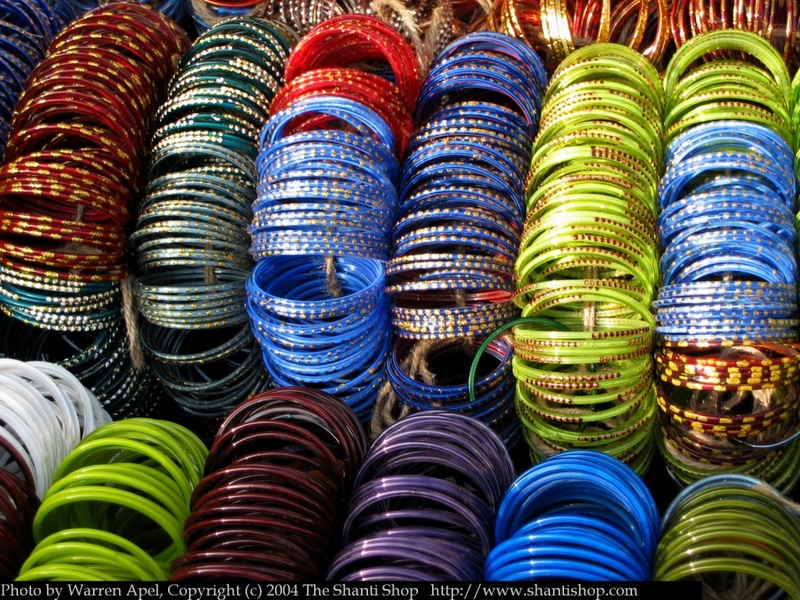 Indian woman love bangles and every one wears a great many. These can be very expansive items, but for the majority of woman the daily bangle is a cheap, highly coloured, decorative, plastic bangle. With so many different programmes happening in the villages, eg government schemes to deliver rice, NREGS work entitlements as well as NGO implemented programmes, and people’s memory being very selective it is easy to forget who got what when. Answer - a “Beneficiaries Information Booklet” complete with blank record card and some really useful information eg a list of the various Government Departments with an explanation of which department is responsible for what, a list of names and telephone numbers of who to contact in case of flood, who to contact about Health issues, who to contact about livestock vaccination etc. A bit like the local area directories that local government and district councils give out in the UK but with the record card aspect added in. Every household will get one, and it will become a very important document, a proof of delivery and receipt to mirror the programme ledgers. It may sound a bit bureaucratic but it works. I think these little things are a really good aspect of Shakti’s way of working. It is these little things that people remember because they are personal. It is these little things that praise, reward, encourage and sustain involvement, participation and enthusiasm for the long term. They are the stepping stones, the small goals, along the achievement path which can often appear long and circuitous. Shakti’s bye-line is catalysing sustainable development and these little things go a long way to ensuring the big picture happens, lasts and doesn’t fade away. Well done to everyone involved. The passion and details you write with make small things seem grand. Small thing #1 of no addresses reminded me of Barthes book about Japan "Empire of Signs".